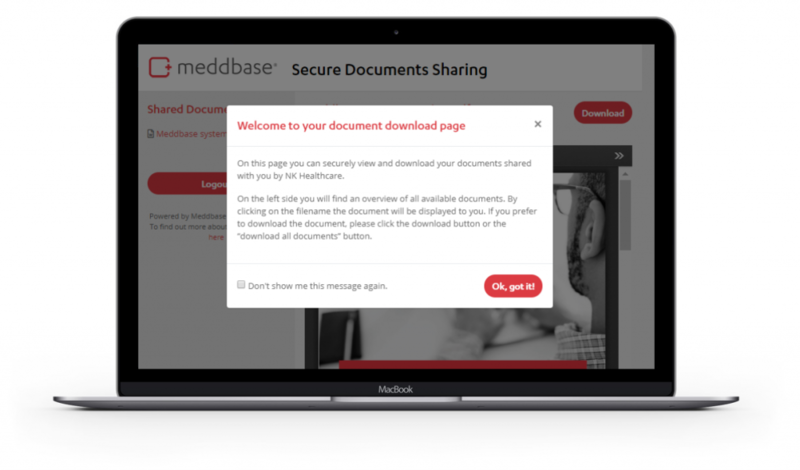 A fully integrated secure document and file sharing management system is integrated into Meddbase and allows users to create, save and securely share documents or files via the Meddbase Secure Document Sharing Portal. Images, documents or even audio files can be shared with 3rd party users via the Secure Document Portal. Select the files within meddbase you wish to share, enter the recipients cell phone number and email address then hit Send. Meddbase will send your message and link to the recipient. When your recipient opens the link, they will be displayed with the last 4 digits of their cell phone number for verification. By clicking “Request Code” meddbase will send the recipient a 6 digit pin to the cell phone number entered. Your recipient will enter this number into the site to access the files. From here, all files are accessible to view or download. The Secure Medical Document Sharing feature is fully customisable. Insert your own default text templates for the default sharing message and include your own branding within the email and the document sharing portal.